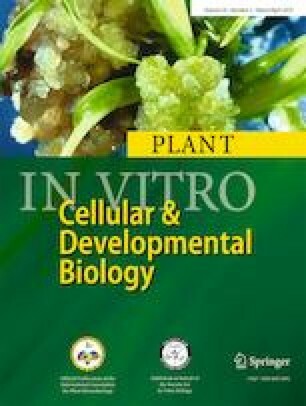 Genetic transformation of most indica rice (Oryza sativa) cultivars is hampered by poor in vitro culture performance and low regeneration potential. Histological study of primary calli can provide substantial information on their regeneration potential and can be used for early grading of calli expected to develop plantlets on regeneration media. The study was aimed to undertake histological analysis of primary calli derived from mature seeds of five indica rice cultivars viz. KSK-133, KS-282, Shaheen Basmati, Super Basmati, and DilRosh in order to assess their regeneration potential on different media combinations supplemented with various hormone concentrations (N6 + 2 mg/L 2,4-Dichlorophenoxyacetic acid; N6 + 2 mg/L 2–4 D + 2 mg/L Benzylaminopurine and MS + 2 mg/L 2,4-D). Calli with regeneration capability were subjected to histological assays by examining toulidine blue stained 5–8 μm thin sections for the presence of meristematic zones exhibiting embryogenic callus features. Based on our observations, formation of embryoids or embryoid-like structures was pronounced in KSK-133 and KS-282 calli. However, DilRosh, Super Basmati and Shaheen Basmati did not show these characteristic features. Three-week-old calli of all rice cultivars were transferred into regeneration medium (MS + 2 mg/L BAP + 1 mg/L Naphthaleneacetic acid). KSK-133 and KS-282 showed the highest regeneration potential (81% and 76%, respectively). These data were supported by histological observations where characteristic embryogenic units (EU) were noticed in these genotypes. These meristematic regions displayed high mitotic activity and stained relatively dark. The embryogenic calli cells were found heavily cytoplasmic with prominent nuclei and were located on the callus surface or inside surrounded by parenchymal cells. The online version of this article ( https://doi.org/10.1007/s11627-019-09974-6) contains supplementary material, which is available to authorized users. We are thankful to Prof. Barbara Baldan, Department of Biology, University of Padua, Italy, for providing the microtome facility for histological analysis. We are also grateful to Dr. Tahir Abbas Shah, Department of Biosciences, CUI, Islamabad, Pakistan for assistance in the statistical analysis of data. This work was supported by Erasmus Mundus Mobility for Asia (2014) grant no. ID06884 awarded to Ms Bushra Ijaz. Mendoza AB, Hattori K, Futsuhara Y (1992) Shoot regeneration from the callus of immature primary leaves in Mungbean Vigna radiata(L.)Wilczek. Ikushugaku zasshi. 42:145–149. https://doi.org/10.1270/jsbbs1951.42.145.